This is the Update Site for installing the Sidebar Chart plugin for the Lotus Notes 8.x Standard client, first demoed at Lotusphere 2009 in session BP111 by Rob McDonagh and Julian Robichaux. If you wish to use this application, please see the copyright notices and usage information at the end of this page. Source code for this application is available in the following files: acme.sidebarchart_1.0.1.jar, com.nsftools.charthelper_1.0.0.jar, com.ibm.lotuslabs.context.service_1.0.0.jar. We used the ever-reliable JFreeChart library by David Gilbert for charting. JFreeChart is licensed under the terms of the GNU Lesser General Public License, and both source and binaries are available from the JFreeChart download page. Also, in keeping with the LGPL license, you can download the source for JFreeChart 1.0.11 from here (1.0.11 being the version we used for this plugin). The code used to listen for changes to the active Notes View is from Brian Leonard's excellent article on IBM developerWorks: Leveraging user context in the IBM Lotus Notes V8 sidebar and toolbar. The Domiclipse DocViewer sidebar plugin was also a fantastic resource. From the Lotus Notes 8 Standard client (the Eclipse-based one), select the menu option File > Preferences > Widgets. Make sure the option for is checked. Open the Sidebar in the Notes client and expand the "My Widgets" panel. 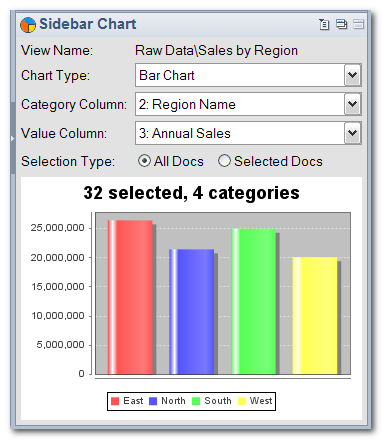 Download this file to your computer: sidebarchart_widget_install.xml. Then drag the file from wherever you downloaded it over to the My Widgets panel. You should be prompted to install the Sidebar Chart Plugin. Follow the prompts to install. You will be asked to restart the Notes client when you're done. If you are not prompted for an install, check the proxy settings in your Location document to make sure your Notes client can access the Internet, and also ask your Administrator if they have locked down the installation of Widgets and plugins. If you have views open in multiple tabs, the chart should represent the values in the current active view (please see Known Issues below). If you switch between views, this app should remember the last settings you chose for a particular view. There is also a sidebar menu option to save the currently displayed chart to a file. There are sometimes focus issues with Sidebar apps. Specifically, sometimes a Notes View that is visible in the client does not send selection notifications to Sidebar apps until you actually click on a document in the view (clicking in the left-hand view gutter doesn't always set focus either). You should have received a copy of the GNU Lesser General Public License along with this program. If not, see http://www.gnu.org/licenses.